Next task in project planning phase is to create the project schedule, in three steps. The network diagram represents the logical sequence of all work packages. We answer the question: in what sequence do we have to do all the work? In that example, we could end up with a network diagram like the following. 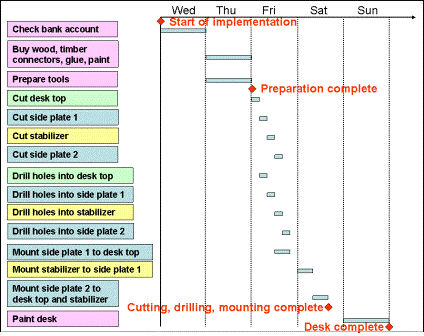 The Gantt chart represents the sequence of all work packages with reference to a time line. Each work package is symbolized by a bar with a length that corresponds to its duration. 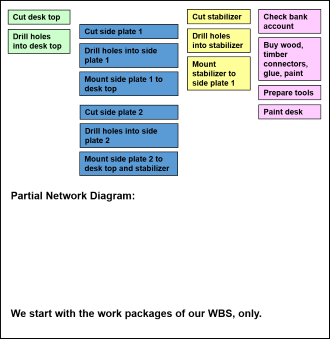 We usually set up the network diagram with some project planning software package, like MS Project. So, we can switch back and forth between the network diagram and the Gantt chart by simple mouse-click. In case we set up the Gantt chart manually, we make sure that we keep the same logical sequence of work packages as in the network diagram. For larger projects, we need to have an overview of the schedule for the project as a whole. We achieve this by introducing milestones that indicate significant points in our project schedule. On project level, we present the milestone plan that shows only milestones with reference to a time line. On the next page, we will introduce the calculation of dates and total float of a project. We created an e-book with all the course content based on the same structure. The e-book comes together with an answer key for all the test questions, both in pdf-format. There is also a CBT of this course available so that you can work on it when you cannot connect to the internet.